20 years ago, Brain-Computer Interfaces could only move computer cursors. Today, machine learning is one component of BCI’s that will be used in many different fields of neuroscience, such as motor rehabilitation of stroke patients, assessment and communication of coma patients, control of devices for disabled people, cognitive training or neuromarketing. The BR41N.IO Brain-Computer Interface Designers Hackathon has been created to show these current and future developments and unlimited possibilities of Brain-Computer Interfaces in creative or scientific fields. Furthermore, BR41N.IO aims to help understanding how artificial intelligence, life science, art and technology become a unity to evolve innovative and exceptional BCI headpieces. The BR41N.IO hackathon series brings together engineers, programmers, designers, artists or enthusiasts, to collaborate intensively as an interdisciplinary team. They program or build their own fully functional EEG-based Brain-Computer Interface (BCI) to control a drone, a Sphero or e-puck robot or an orthosis. The participation only requires basic knowledge in Brain-Computer Interfaces, machine learning, programming or designing. 2017 was the initial year where BR41N.IO took place in Dublin (Ireland), Linz and Graz (Austria), Valencia (Spain) and Banff (Canada) for the first time. Participants from all over the world have been working together and achieved innovative and playful BCI headsets and applications within 24 hours. Hacking projects aim to use EEG electrodes and amplifiers and challenges programmers to code an interface which makes them able to control devices, robots or applications, to write messages or to draw paintings by using their thoughts only. BR41N.IO challenges creative minds to design and build a unique, playful and wearable headpiece which is able to measure useful EEG signals in real-time to create any sort of interaction. 3D printers, handicraft materials and sewing machines are on-site, so the teams will be able to give their BCI headpieces an individual design. They are also able to use Brain-Computer Interface to produce artful paintings or post a status update in their Social Media accounts. And finally, kids create their very own ideas of an interactive head accessory that is inspired by animals, mythical creatures or their fantasy. 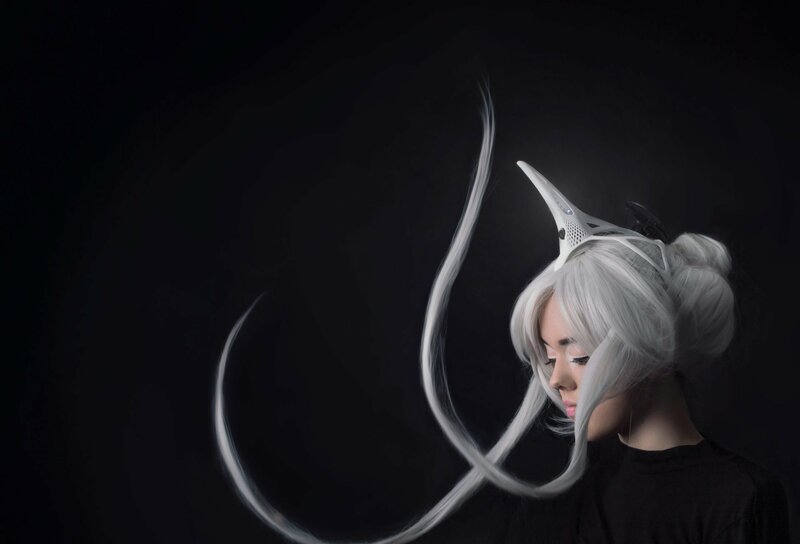 BR41N.IO is inspired by the unique “Agent Unicorn” headpiece from Fashion-Technology-Artist Anouk Wipprecht, an accessory shaped like a horn on a unicorn, for children who suffer from ADHD or autism. Agent Unicorn is a Brain-Computer Interface (BCI) headpiece that measures brain activity to find out what might trigger these children and give a better understanding of their individual distractions. Read the interview with Anouk Wipprecht on the g.tec blog.